The slave trade began with Portuguese, and some Spanish, traders taking African slaves to the American colonies they had conquered in the 15th century. British sailors became involved in the trade in the 16th century, and the Treaty of Utrecht (1713) gave them the right to sell slaves in the Spanish Empire. In the 18th century, perhaps 6 million Africans were taken to the Americas as slaves, at least a third of them in British ships. 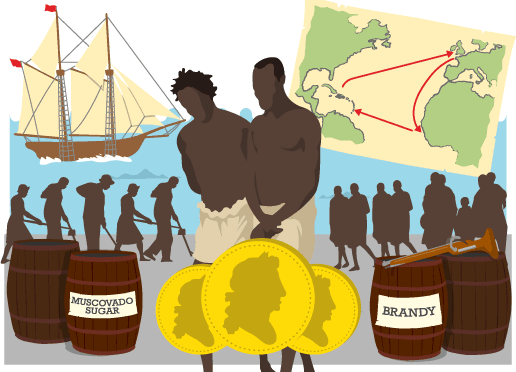 Taking trade goods, such as guns and brandy, to Africa to exchange for slaves. Then taking the slaves on the ‘Middle Passage’ across the Atlantic to sell in the West Indies and North America. Finally, taking a cargo of rum and sugar back to sell in England. Conditions on the Middle Passage were terrible, and many slaves died. After 1700, the numbers of slaves being transported increased greatly – perhaps 6 million Africans were taken as slaves to the Americas. A British slave ship set off from Liverpool or Bristol, carrying trade goods, and sailed to Africa. Some slaves were captured directly by the British traders. They ambushed and captured local people in Africa. Most slave ships got their slaves from British ‘factors’, who lived full-time in Africa and bought slaves from local tribal chiefs. The chiefs would raid a rival village and sell their captured enemies as slaves. In 1700, a slave cost about £3-worth of traded goods eg cloth, guns, gunpowder and brandy. The slaves were marched to the coast in chained lines called coffles, where they were held in prisons called ‘factories’. The ship then sailed across the Atlantic to the West Indies – the ‘Middle Passage’. In the West Indies the slaves were sold at an auction called a ‘scramble’. Some were sent to ‘seasoning camps’ to be trained to obey, often using brutal methods. The selling price of a slave in the West Indies in 1700 was £20, so there was a good profit to be had, which made the risks worthwhile. Some ships, but not all, then loaded up with sugar and rum to sell in England. At the end of the 18th century, public opinion began to turn against the slave trade. Some African rulers refused to sell slaves to the traders. Occasionally villages attacked British slave ships and set the slaves free. Sometimes slaves mutinied on board ships. The most famous case was the Amistad in 1839. There were many slave rebellions. The most famous slave leader was Toussaint l’Ouverture, who led a successful slave revolution in French Saint Domingue in 1791. In Jamaica, runaway slaves formed ‘Maroon’ communities that fought against the British soldiers. In Britain, slaves, like James Somersett, frequently ran away from their masters. When he was recaptured, he and his friends contested his case in the courts. In 1787, the Committee for the Abolition of the Slave Trade was set up. William Wilberforce represented the committee in Parliament. The campaigners boycotted sugar, wrote letters and presented petitions. Thomas Clarkson went on a speaking tour, showing people chains and irons, and a model of a slave ship. Other campaigners published leaflets describing conditions on the Middle Passage, and atrocities such as the Zong incident (1781). The captain of the slave ship Zong threw 133 slaves overboard so he could claim the insurance. British Africans such as Olaudah Equiano formed the ‘Sons of Africa’, and campaigned against the slave trade. There is some evidence that the slave trade was becoming less profitable – the price of buying slaves in Africa was rising, reaching £25 in 1800, but the price for selling in the Americas had not risen as quickly and was only £35 in 1800. 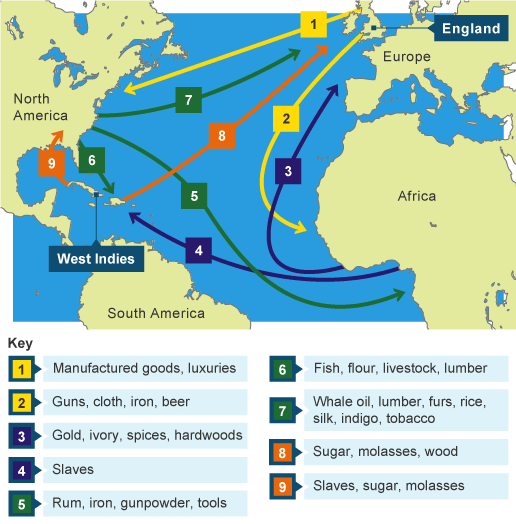 The slave trade was huge – British ships transported 2.6 million slaves. It has been estimated that, overall, about 12 million Africans were captured to be taken to the Americas as slaves. Over 55 per cent of the slaves were taken to Brazil and Spanish South America. Less than 5 per cent of slaves were sold in North America. The death rate of the slaves was horrific. Unknown millions died in Africa before they even made it to the ships. It has been estimated that perhaps a fifth of the slaves died on the Middle Passage across the Atlantic. In the Americas, the death rate amongst the slaves was also very high. Some historians suggest that the death rate in the ‘seasoning camps’ was up to 50%. The African slaves took with them their religion, traditions, cooking, clothes, music and dance. These had a huge effect on the Americas leading to voodoo in the West Indies, the Creole language in Haiti, blues music in the southern United States and many other influences. Many historians think that white supremacist racism grew in the United States and Europe because the slave under-class in the West Indies and America were all black Africans. The slave trade ruined Africa because of the constant wars and the loss of millions of strong, young people. Africa fell behind the rest of the world. Some historians think that this is why Africa was colonised by European countries in the 19th century. The African historian Joseph Inikori (1987) suggested that the slave trade allowed the Industrial Revolution to happen. British industry benefited by supplying the factory made goods in exchange for slaves. Profits made in the slave trade provided money for investment in British industry. After Britain abolished the slave trade in 1807, the British navy ‘West Africa Squadron’ patrolled the Atlantic Ocean trying to stop the slave trade. The British also signed anti-slavery treaties with many African rulers. For many years, historians presented an account of the slave trade from a British point of view. 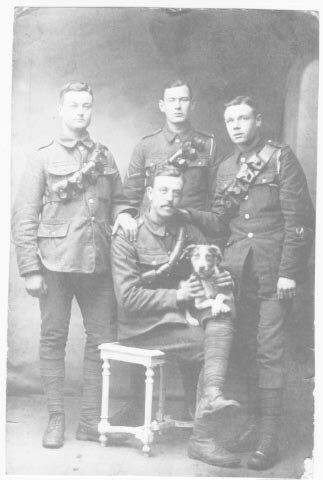 They portrayed it as cruel and evil, and that the British realised it was morally wrong. Led by Wilberforce, they abolished it and then spent the rest of the 19th century trying to stamp it out. In 1944, Eric Williams, a historian who later became Prime Minister of Trinidad, showed that the slave trade hadn’t been making as much money in the years before abolition. He argued this was the reason it was abolished. Recently, historians have shown that black Britons and women played significant parts in the Abolition campaign. Historians have also shown the importance of James Stephen’s bill of 1806. In effect, Parliament only abolished the slave trade when it had all-but-collapsed anyway. The 1960s and 1970s saw other challenges to the traditional interpretation. Historians realised that much of the information about the Middle Passage came from Abolitionist propaganda and was not really to be trusted. Other historians began to draw attention to the role of the African rulers in the slave trade – when the British abolished the slave trade in 1807, the King of Bonny in Nigeria wrote to Parliament to complain. Despite the changes in historians’ view, most people still think of the slave trade in the traditional way. Alex Haley’s book, Roots, which was made into a hugely popular mini-series in 1977, portrays most people’s traditional interpretation of the slave trade. And when, on the bi-centenary of Abolition, the film Amazing Grace (2007) was brought out, it focused almost wholly on the work of Wilberforce. The only black Briton portrayed in the film was Olaudah Equiano, and he spoke only one line. The slave trade is not just a historical topic – it is a current political issue. In 2006, British Prime Minister Tony Blair expressed “deep sorrow and regret” for the slave trade. Many people said he had not gone far enough, and that Britain should pay compensation to African nations for the slave trade.